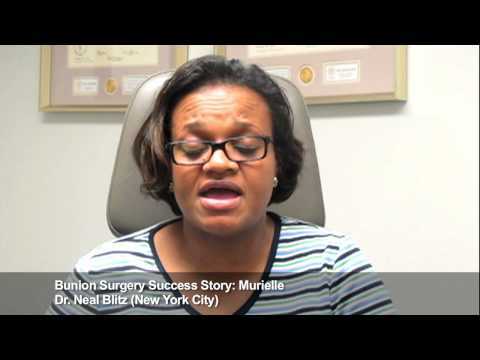 Murielle had previous bunion surgery that resulted in the immediate return of her bunions. She traveled to Dr. Blitz for revision bunion surgery on both feet at the same time. After surgery on both feet she was walking in a surgical shoe (No Cast No Crutches™). She is a registered nurse and is pleased with her now straight bunion free feet. Hi, I’m Murielle. I’m from Maryland. I came up to New York to see Dr. Blitz for a revision of some Bunionectomies on both of my feet. I had my previous surgeries done with a physician in Maryland. I trusted her very much. She used to give me injections for pain and she did surgery on my right foot first; promised she would correct the bunions. 2 weeks later, she did the 2nd foot and 5 weeks thereafter, both my big toes were turned inwards. The procedure failed. The bunions were not corrected. I then proceeded to do my own search because I was in pain and I needed for my feet to look right. I did my own search on the internet and I found Dr. Blitz. I did my own search and I called him. His team saw me right away, they fit me in. I chose Dr. Blitz for revision because it was very difficult. Talking to the physician who did my surgery for me before explained she couldn’t do the surgery at the base of my foot where it was situated/where it was located. So I decided to find a physician who was experienced with the kind of bunions that i have because they were described to me as severe bunions. So I did my search, found Dr. Blitz, and sure enough, he was able to do the corrections. Dr. Blitz has created a surgery that requires no crutches. He did both of my feet at the same time and I am able to emulate with no difficulties. I’m back, I’m up and I’m walking around. Now after the surgery, my toes are straight, they are all aligned. I feel like I have beautiful feet. My experience with Dr. Blitz in the office was excellent. Well understanding staff. I am also a nurse. I work in a very big institution; a teaching institution. One thing I would like to add, regard this to all, right here in New York City, or Maryland like me, or the Kingdom of Saudi Arabia, in Europe, wherever you are, you can trust your feet to Dr. Blitz. It's been a year since my bunion surgery and my foot looks great... I can do everything I did before, if not better. I am so happy with my foot. Lynn is extremely happy one year after having her large bunion fixed by Dr. Blitz, using his patented bunion implant and Bunionplasty® procedure. She is back to yoga and wearing shoes without pain. Hi, my name is Lynne and I had bunion surgery with Dr. Blitz. It’s been a year since my bunion surgery and my foot looks great, the scar is hardly noticeable. I can do everything I could do before but better. My shoes fit better. I can do yoga and I haven’t lost any mobility. The best part is I’m not in pain or discomfort anymore. 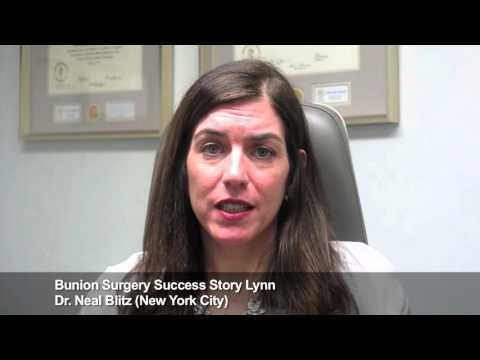 When I was researching Bunion surgery in New York, of course, Dr. Blitz’ name came up first, front and center. So of course, I had to click on it. I did a lot of research. Dr. Blitz made me feel instantly comfortable and I was quite the nervous patient. I had asked tons of questions because I had done research, I had come in armed with all of these things I wanted to know and he was great. He talked me through every step, he was very patient, very compassionate and it just made me feel so comfortable. I am so happy with my foot. Success story patient of Dr. Blitz. This patient had Lapidus Bunionectomy and Removal of Arthritis at the big toe joint. The patient is very happy with the result. My name is Marie. I simply am so happy that I found Dr. Blitz. He did the surgery for me, I had problems with my bunion, arthritis, bone scars, and it was getting to the point where I couldn’t really walk anymore. And I went online with my boyfriend and both of us found Dr. Blitz as one of the top surgeons in Manhattan. That’s why I looked into it, I researched and I decided to go and see him. I did, I was very happy, what I saw and heard and I had him do the surgery. And I am absolutely happy… I have no words to say that… I am glad I did it. Before I got the surgery, I was actually walking holding on because when I would put pressure on my foot, I would get pain on my foot and what was happening was I was walking on the side of my foot and it was affecting my hip and my lower back. And it got to the point where I couldn’t take it anymore, this was going on for quite a while. Now after the surgery, I’m walking around and I have no pain. And it’s just absolutely wonderful. Well I really didn’t intend on going on sort of my insurance. I did go to two other doctors before I came to you. And when I spoke with you and based on the exam and our conversation, I just had a very good feeling about you compared to the other two doctors that I had gone to. And I… based on the research that I did, I felt that you were the best one to go to, so that’s what I did. I spoke with [Cher] and she is a sweetheart, very accommodating I have to say. And I felt that she kind of takes it personal where she gave me her cell number at one point where I needed to contact her. And she answered any of my questions that I needed and it just… there’s no more to say. She was just great and the office was great. If you have bad foot problems, especially like I did, bunion, or even if it’s just you don’t like the way your foot looks because of the bunion… get it done. It’s not as scary as it was, to me. I was scared about doing it because everyone told me how painful it is and how long it takes to… for it to heal. I especially knew because my daughter had it done twenty years ago and I saw what she went through with the pain. And I was kind of reluctant to have it done because remembering how she was in pain, I didn’t want to go through that. But it’s not like it was twenty years ago. My foot looks good, I like the way it looks. The bone’s not sticking out like it was before and I actually like my foot. Yeah, I want to thank my boyfriend because he actually found Dr. Blitz online and he helped a lot with the research. I recommend Dr. Blitz to my friends and I have already recommended Dr. Blitz to strangers. 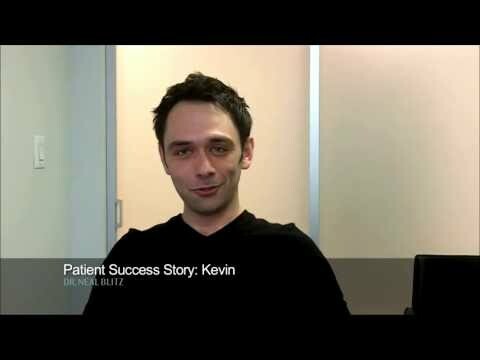 Success story patient of Dr. Blitz. This patient had a bunionplasty and hammer toe surgery on both feet. The patient discusses her results and experience with Dr. Blitz. Hi. My name is Nancy. And I came to see Dr. Blitz for hammertoe and bunion surgery. And it was probably the most… the best decision I’ve made in years. Before coming to him, the pain was excruciating. I did a little bit of research and found him very quickly and easily online. And now I’m looking forward to having my next school year being pain free and no more corns, no more bunions, wearing my shoes again. A few months ago, I realized that it was getting more and more difficult. I was spending fifty, sixty dollars a month on supplies to cushion the corns on my feet, the bunions… just shoes, constantly buying shoes and I realized I needed to do something more. I spoke to a few friends who have had bunion surgery and they told me of their experiences. I started looking online, saw a few videos and it was a bit intimidating. And then I saw his interview on… I believe it was ABC news. And I saw his interview and I realized he sounds confident, he sounds capable, he sounds like someone I can trust. I had, I believe six corns and the bunion. Since the surgery, my foot looks amazing. The healing is going great. The incision site is phenomenal. This is a great place. If you are considering surgery, it is a first choice on your list, it should be the first choice. Dr. Blitz’s staff is amazing. [Cher] is phenomenal, she was there whenever I called, asked me to come in, they were always available, they would listen. Success story patient of Dr. Blitz. This patient fully lacerated 2 tendons and the plantar plate ligament after stepping on glass. Dr. Blitz repaired the tendons so that he can regain function to his foot. Hi! My name is Kevin. I’m a 29-year-old medical student. I had an unfortunate accident where I tore two tendons in my foot and a ligament. I actually found Dr. Blitz almost by accident but it was meant to be because he repaired everything that was wrong. He caught the problem immediately that my primary physician missed and had it not been for him I would probably have never been able to return to the really active lifestyle that I’m used to. I was so worried. I can rock climb. I can run. I would recommend to anybody to go see him who has pain problem or something wrong with their foot. Basically Dr. Blitz will see you as a patient but he will treat you like a friend and a member of the family, part of the team. I think that nowadays it’s pretty difficult to find a doctor who really engages with the patient. I would definitely say that it’s very, very comfortable and professional but in a friendly environment. The definition of irony I would say is in my certain case I was jumping out of the way to dodge a really big plate that somebody dropped and landed on the glass, which I was trying to avoid. I cut and lacerated two tendons and a ligament. I would definitely say the experience was very humbling. As a medical student studying to become a foot doctor as well, I should have caught my own injury but I didn’t. That’s okay because Dr. Blitz caught it immediately and evaluated the problem at once. I owe the world to Dr. Blitz because without him I wouldn’t be very mobile and probably not for the rest of my sports activity career.